Anemone dahlias are exquisite, having a double flower head with one or more rings of flattish petals that surround a densely packed centre which is made up of tubular florets that point upwards. These florets are longer than those found on single dahlias, which contributes greatly to their stunning overall effect. Anemone dahlias are normally about 4 – 6 inches wide (10 – 15 cm). Most anemone dahlias can grow to heights reaching 4 ft (120 cm) but bedding varieties can also be found which are a less lofty 2 ft (60 cm) tall. Purple Puff – this has outer petals that are a light purple colour. These graduate to a much deeper burgundy towards the centre of the flower which is about 4 inches in diameter (10 cm). They work very well in a border, reaching heights of around 3 ft 6 inches (1 metre). 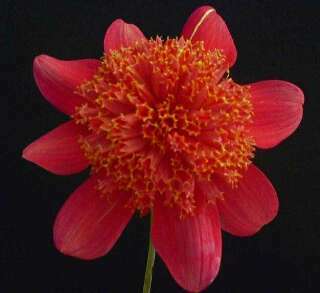 Slow fox – this is a more delicately coloured dahlia which has paste pink outer petals which graduate to white as they reach the centre of the flower which is around 3 – 4 inches in diameter (7 – 10 cm). The middle of the flower is a pale yellow and the foliage is green. This can grow to a height of 3 ft (90 cm). Blue Bayou – this is a very delicate flower which has pastel lilac coloured outer petals and a striking claret coloured central part. The foliage is a lighter shade of green and plants reach a height of 70cm (just over 2 ft).